One of the most important cornerstones of Toybank’s welfare work has been it’s interaction with teachers from our partner NGOs and schools. Over April through June, we have conducted 8 such teachers’ training sessions, impacting 134 teachers in the process! The most recent of these were conducted for the amazing teachers of Gilder Lane Municipal School, Sanskriti Samvardhan Mandal in Nanded and our MHB partner schools in Malvani. Through sessions like these, Toybank connects with teachers in small groups to sensitize them to our work, understand the power of play and the need to introduce it in any measure in a child’s life and how they can help propagate the joy and learning through games and play among their students in a fun and engaging way. We also learn a lot about the challenges teachers face like absenteeism and issues with concentration that is something children everywhere face, but the teachers at such schools face everyday. Building a rapport with these schools, our field officers are able to exchange new games and ways to keep children engaged and involved with activities at school through Play. In our visit to our centre in SSM, Nanded, the training session brought out some incredible stories of how play has changed the mood and spirit of the school in a big way. 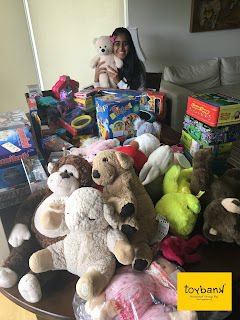 The Toybank team was touched by the work of a talented artist the school has hired to make a game room with all the toys Toybank has set up in the game library at SSM. 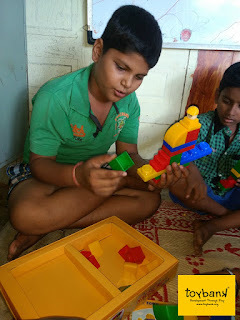 Along with our own research, feedback from sessions like these help Toybank pack our libraries and play sessions with games and activities that are tried and tested success stories!